Oncomatryx is developing precision drugs that target membrane proteins in stromal cells. Tumor immune system suppression. 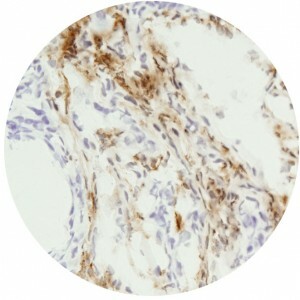 Depletion of MTX5-expressing cells in pancreatic cancer allowed TNF-α and IFN-ƴ immunological control of tumor growth. Depletion of MTX5-expressing CAFs overcame the lack of anti-tumor response of PD-L1 antibodies, and thus synergizing with anti-PD-L1 immunotherapy in pancreatic cancer. Previous approaches blocking MTX5, have failed in Phase II due to lack of efficacy. Oncomatryx approach is not aimed at blocking MTX5, but at using MTX5 as a CAF-specific internalization vehicle for cytotoxic molecules.